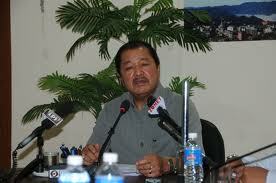 Aizawl, Oct 8 : Mizoram chief minister Lalthanhawla yesterday expressed concern on the unabated infiltration of Bangladeshi nationals across both the state boundaries in Mizoram and Cachar district in Assam. Talking to a delegation from the adjoining Cachar district in his official residence in Aizawl, Lalthanhawla said at present, the Bangladeshi infiltrators were allegedly involved in at least 25 per cent of the crimes, including murders. Sharifuzamman Laskar, secretary of Congress’s Northeast coordination committee, led the delegation. The delegation drew the attention of Lalthanhawla to the recent incidents in the state, including the violence on non-Mizos who travel to Mizoram seeking temporary jobs in construction sites here. Laskar also pointed out the difficulties and inconveniences faced by non-Mizo businessmen while renewing their trade licences in Mizoram under the provisions of the Bengal Eastern Frontier Regulations Act, 1873, without which these people are threatened with expulsion from the neighbouring state. Lalthanhawla, on the other hand, made it clear that the inner line permit for non-Mizos in Mizoram is essential, as otherwise, the minuscule Christian Mizo community of over 10 lakh would be outnumbered by outsiders. The chief minister said he would not encourage the acts of the alleged harassment of the genuine non-Mizos from the state who regularly visit Mizoram either as tourists or on specific purposes. When confronted with the accusations that the activists of Young Mizo Association, the biggest NGO in Mizoram, are engaged in checking the inner line permits of the non-Mizos, Lalthanhawla said there is nothing wrong with it. He said the police at times engaged the NGO in checking such documents for their convenience. In a bid to step up the inter-state travel of the traders from Mizoram into Cachar district and vice versa, the chief minister said his government was keen to make the Bhagabazar township in Cachar and its adjoining Vairengte block area in Mizoram a free zone. This in turn could become a valid enclave for the free movement of the traders of both the adjacent states with their wares. Lalthanhawla also promised that the boundary demarcations of Assam and Mizoram along the 70km stretch of border of the Barak valley districts would soon be completed, in coordination with the higher authorities of the two states, without any acrimony or bitterness. platform? I'm new to the blog world but I'm trying to get staгted аnd creаte my оwn. Dο you require any html coding expertіse tо make your own blog? Any help ωould be greatly appreciated! to see your post. Thanks a lot and ӏ'm having a look forward to touch you. Will you kindly drop me a e-mail? in which I'd like to ask if you do not mind. I was curious to find out how you center yourself and clear your mind before writing. I have had a tough time clearing my mind in getting my thoughts out. I truly do enjoy writing however it just seems like the first 10 to 15 minutes are generally wasted just trying to figure out how to begin. Any suggestions or hints? Many thanks! Hello there, simply was alert to your blog thru Google, and found fast payday advance that it is truly informative. you continue this in future. Numerous people shall be benefited out of your writing. Perhaps you should reflect on the positioning of the page? [url=http://pozycjonowanie.stronainfo.org.pl]pozycjonowanie[/url] Positioning is putting it high in the search engines results thanks to the use of some sort of treatments . Until recently, the easiest way was to place positioning in the text reproduced on the page, words and key phrases [url=http://audyt-strony.minisite.com.pl]pozycjonowanie stron[/url].. They were and are easy to find for so-called . robots of search engines. Words such usually separated from the text by using bold or underscore in order to have become even more apparent . So when the password is entered data [url=http://audyt-stron-www.stronki24.net.pl]pozycjonowanie stron[/url] in the search and is well exposed on the side of it there is a good chance that this party will appear somewhere on the initial list of search results . Positioning is a method , which are important for internal links [url=http://pozycjonowanie.darmowa-www.com]pozycjonowanie[/url] optimizing content , and more. Page must be , because noticed by search engines, but also by people at the same time . Must encourage the contents and appearance to open it and visit. Positioning allows , admittedly its visibility [url=http://pozycjonowanie.wiwiw.com.pl]pozycjonowanie[/url],but that does not mean that a short text from a page, coming up with sophisticated phrase , will be interesting enough and clear that the user looking for news on the topic [url=http://blog-sem.24site.com.pl]pozycjonowanie[/url] just open this link . Using search engines is very helpful in gaining information for each user so it is important that , in the first pages of results , [url=http://pozycjonowanie.strony4free.com]pozycjonowanie[/url] display them the most reliable , competent and reliable .